In addition to being the first week of classes for the spring semester, this week at Notre Dame also saw the celebration of Martin Luther King Jr. Day. The holiday was marked on campus with Walk the Walk week, a series of public events focused on issues of race, diversity and inclusion. University photographer Barbara Johnston captured this photo on the federal holiday, Monday, January 15, at the kickoff event, a late-night candlelight vigil held in the rotunda of the Main Building. 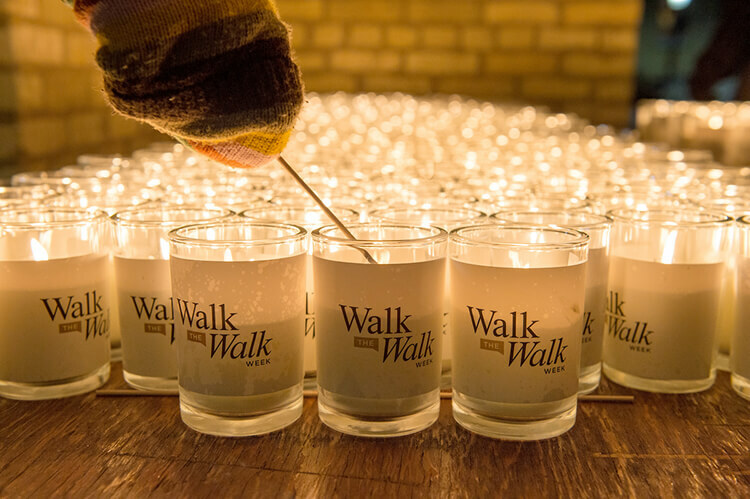 Walk the Walk week ends with an MLK Celebration Luncheon on January 22, but, to keep the conversation going, Notre Dame Magazine will feature a number of essays and articles on race in the coming week. Stay tuned to magazine.nd.edu for a reflection on race relations in the 1960s South from editor Kerry Temple ’74, an essay on life in a multiracial family from sophomore Eleanor Lyman and an updated look at the story behind the iconic photo of Father Hesburgh arm in arm with Dr. King. Originally published by Sarah Cahalan ’14 at magazine.nd.edu on January 19, 2018.